In honor of Banned Books Week, we are sharing some reflections one of our team members wrote. Though not exactly bringing fiction into the everyday, we think that celebrating banned books is an important way to honor the value of all kinds of books in our lives. Even–and especially– if we disagree with them. I’ve been told that I have a special characteristic that makes me able to enjoy American literature. Tolerance. I’m not sure how others get turned off to American writing, and I’m the first to admit that it is not necessarily the best in the world all the time. But for a nation so young, I think we’ve done alright so far. To my thinking, Call of the Wild is just about as American as it gets. It’s about a dog named Buck who is kidnapped from his home in California, and sent to pull a dog sled in the Klondike gold rush. 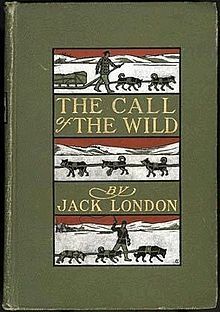 The setting of the story is very “Manifest Destiny”, and the Klondike gold rush was something that author Jack London experienced for himself firsthand. As for the plot, what’s more American than an adventure to seek treasure in the unexplored regions of our continent? London’s book is short, his writing crisp. And let’s not forget the other thing Americans love: dogs. During the course of the story, Buck changes from a simple domesticated dog to something of a wild animal. He increasingly draws on a fierce strength buried somewhere beneath his persona until finally this wildness beckons him away from the human world altogether and back into the life of a wolf. As this prehistoric consciousness arises in Buck, London elicits a similar sort of feeling in the reader. We, like Buck, have an ancient strength underneath our skin, bristling to get out. As I read the book, I wondered if I, like Buck, have become domesticated over time, and maybe I should tap into that ancestral ferocity. Of course, London’s message that humanity may have lost something crucial to our identity flies in the face of the idea that humanity is gradually improving. Maybe that’s why the Nazis burned Call of the Wild in 1933. Getting off the evolutionary track doesn’t exactly create a super-race. Instead, Jack London proclaims that we used to be something great, and that greatness is still within us. Follow #BannedBooksWeek or @BannedBooksWeek on twitter.